The AWS A5.13 EFe1 is a typical iron base hardfacing electrode. It has a pearlitic structure, which results from low carbon and low amounts of other alloying elements. 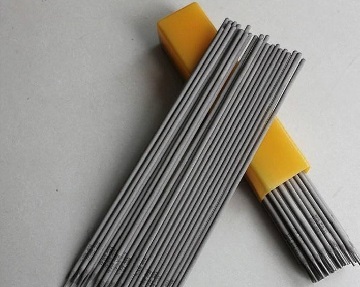 The EFe1 electrodes are mainly used for buildup overlays and restoration of carbon steel and low alloy steel machinery parts in hardfacing applications. It has high impact resistance and relatively low hardness, as well as excellent weldability. The buildup overlays may only provide mild resistance to wear. Its main function is to return a worn part back to or near, its original dimensions and to provide adequate support for subsequent layers of true hardfacing materials. Sizes: Φ3.2 mm, Φ4.0 mm, Φ5.0 mm; Length: 350 mm/ 400 mm. Chemical Requirements (AWS A5.13, wt%): C:0.04~0.20, Mn: 0.5~2.0, Si:≤1.0, Cr:0.5~3.5, Mo:≤1.5, Fe: remainder, O.E.T: ≤1.0. Typical Composition (wt%): C:0.12, Mn:0.58, Si:0.45, P:0.026, S:0.010, Cr:1.7, Mo:0.01. Characteristics: low hydrogen flux coated, DC+ or AC power polarity, easy deslag. Applications: (room temperature & noncorrosive conditions) weld overlay or restoration of shafts, rollers, tractor or rail road rails, large slow-speed gear teeth, and other parts in heavy machinery subjected to rolling, sliding, or impact loading. Welding Current Parameters: 80~120 A for Φ3.2 mm, 120~160 A for Φ4.0 mm, 160~200 A for Φ5.0 mm. Welding Precautions: preheating and re-drying at 300~350°C for 1 hour; storage in dry and clean area; contamination on base metal and weld metal shall be cleaned thoroughly before welding; short arc welding is recommended.